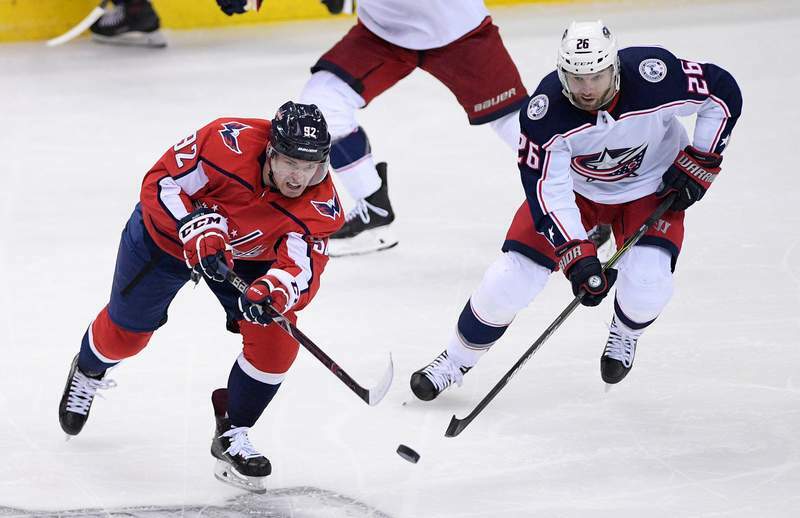 Associated Press Washington's Evgeny Kuznetsov, left, passes the puck against Columbus Blue Jackets left wing Thomas Vanek on Thursday in Washington. When Vanek and the Buffalo Sabres beat the Philadelphia Flyers in six games in 2006 to advance, the rookie winger looked across the locker room at 37-year-old Teppo Numminen, who was on the verge of tears. Numminen had never made it out of the first round in his previous 16 NHL seasons and was overjoyed. “It hit me right there and then, 'Man this is hard,' ” Vanek said. Vanek is now on the other side. In the playoffs for the seventh time, he is the Columbus Blue Jackets' oldest player at 34. Postseason struggles and inconsistencies have followed Vanek his entire career. Based on his play down the stretch and in Game 1 against Washington, he looks poised for some playoff redemption. Vanek had a goal and an assist to help the Blue Jackets take a 1-0 series lead on the Capitals, and young teammate Artemi Panarin scored the game-winner to finish with three points – two more than he had in Chicago's first-round sweep at the hands of the Predators a year ago. Kekalainen pointed out Panarin was a point-a-game player for the Blackhawks in the playoffs two years ago, so hold up on the reputation rehab there. Getting to the net has never been a problem for Vanek, whose power-play goal in Game 1 came from crashing the crease. But he hasn't always found it easy to score in the playoffs and has struggled with a minus-16 rating in six previous appearances with the Sabres, Canadiens and Wild. Vanek didn't know how he would fit in with Columbus, though the reviews from coach John Tortorella are positive – and honest. Vanek's propensity for defensive miscues and mistakes with the puck, and his sometimes frustrating inconsistencies, have given Tortorella and others grey hairs. Several times leading up to the playoffs and even after his goal, Vanek was asked about making an important contribution. Each time he changed the subject to the need for someone, anyone, on the team to have success.